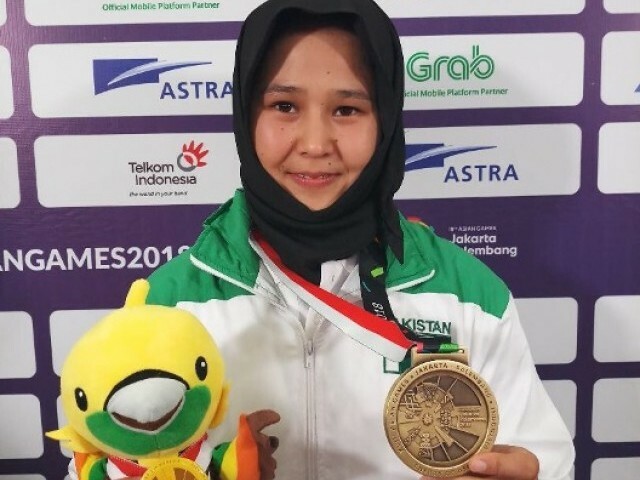 KARACHI : Quetta’s Nargis has become the first Pakistani to win a medal in Karate at the Asian Games. She outplayed Nepal’s Rita Karki 3-1 to claim bronze in the +68kg event in Indonesia on Saturday. Hailing from Quetta’s persecuted Hazara community, the 19-year-old is following in the footsteps of Kulsoom Hazara who won the South Asian Championships earlier. The female karatekas have been striving hard to make their name in the sport and Nargis’ bronze is the much needed head way. She is also the first Pakistani female to win a karate medal at the Asian Games. “I had the expectation of winning the medal, my friends and my coaches everyone were expecting this, i gave everything on the floor,” Nargis said in her media statement. This is Pakistan’s second medal at the Games, earlier Kabaddi took a bronze medal.